P. Sainath, former Rural Affairs Editor of The Hindu, is the 2007 winner of the Ramon Magsaysay Award, Asia’s most prestigious prize (and often referred to as the ‘Asian Nobel’), for Journalism Literature and Creative Communications Arts. He was given the award for his “passionate commitment as a journalist to restore the rural poor to India’s national consciousness.” He was the first Indian to win the Magsaysay in that category in nearly 25 years (after R.K. Laxman). He was also the first reporter in the world to win Amnesty International’s Global Human Rights Journalism Prize in its inaugural year in 2000. His latest award, which he received this January 27th, is the World Media Summit Global Award for Excellence 2014. He won its Public Welfare award for exemplary news professionals in developing countries, taking the WMS prize in its inaugural year. On June 1, 2015, Sainath became the first ThoughtWorks Chair Professor in Rural India and Digital Knowledge at the Asian College of Journalism, Chennai. He is also the holder of the Coady Chair in Social Justice at the University of St. Francis Xavier, Nova Scotia, Canada. He continues to have his home and base in Mumbai while working most of the year in rural India. Sainath, who was awarded a Doctor of Letters (D.Litt) honoris causa by the University of Alberta in Edmonton in 2011 — UAlberta’s highest award – was also McGraw Professor of Writing during the Fall Semester (2012-13) at the University of Princeton. His other awards include: the United Nation’s Food & Agriculture Organisation’s (FAO) Boerma Prize (the foremost award for development journalism) in 2000; the Harry Chapin Media Award in New York, 2006; and was the first and only print media journalist until now to win the Inspiration Award at the Global Visions Film Festival in Edmonton, Canada in 2002. He was also the first Indian reporter to win the European Commission’s Lorenzo Natali Prize for journalism in 1995. Apart from the 40 plus print media awards, two documentary films on his work, ‘Nero’s Guests’ and A Tribe of his Own,’ have between them picked up over 20 awards across the globe. Sainath’s book Everybody Loves a Good Drought (Penguin India, 1996) has remained a non-fiction bestseller by an Indian author for years and was declared a Penguin Classic and had a special edition issued this January with the ‘Classic’ cover. Working on this book involved covering 100,000-km across India. Sainath used 16 forms of transport for this, and walked over 5,000 km on foot. It has been published in multiple editions and in ten languages. The book is in its 34th printing and is presently being used in over 100 universities in India and overseas. 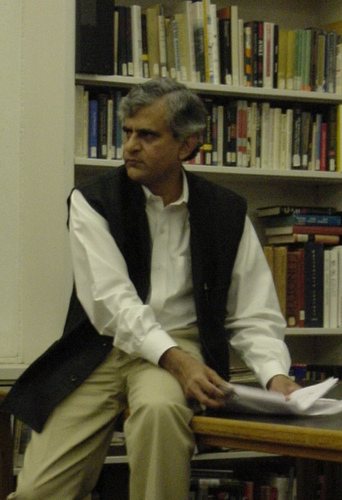 In the late nineties, Nikhil Chakravartty, India’s then senior-most editor, described Sainath’s work as “the conscience of the Indian nation.” In 2000, the leading Scandinavian publishing house, Ordfront, included one of Sainath’s reports in its volume: Best Reporting of the 20th Century. In doing so, Ordfront chose to feature his work alongside that of giants like Gabriel Garcia Marquez, Studs Terkel and John Reed. All royalties from his own book, A Good Drought, go towards funding two to three prizes for rural journalists in India each year. Sainath then undertook a nation-wide project on dalits (those historically subjected to Untouchability under the caste system) for The Hindu. Working on this project saw him cover another 150,000 km across the country. The 40 plus reports he filed were used as major evidence in the National Public Hearings on atrocities against Dalits. His favourite ongoing project is on the nation’s last living Freedom Fighters, mainly little recognised ones from rural India, who fought the British Empire in India’s struggle for Independence. They are dying quickly and the few who remain are in their late 80s and 90s. Sainath has been interviewing them and recording their testimonies and hopes to develop an online archive for those he calls The Foot Soldiers of Freedom. Sainath’s work includes a series on the devastation of Indian agriculture by anti-farmer policies this past decade, which runs in The Hindu. Consisting of detailed reports from the households of landless labourers and marginal farmers across the country, the series has set the agenda for investigative rural reporting. It was of this work on India’s agrarian crisis that the jury of the Prem Bhatia prize said: “Rarely has an individual journalist gone so determinedly against the current of entrenched official orthodoxy, bureaucratic apathy and intellectual smugness.” Sainath’s work on the agrarian crisis has produced the largest journalistic body of work ever on the Indian countryside in terms of the problems faced by farming communities. It is also a body of work that goes far beyond the realm of journalism, capturing issues and complexities that academia and policy makers have failed to. Sainath has spent an average of 270 days a year in the poorest villages of India since 1993 (that figure crossing 300 days in some years).He also takes his own photographs for all his reports. Since November 2001, an exhibition of Sainath’s photographs has toured India, seen by well over half a million people to date. The exhibit, Visible Work, Invisible Women: Women & Work in Rural India mixes text with visuals and brings home the astonishing but unacknowledged contribution that poor rural women make to the national economy. Typically, his exhibition was inaugurated by the women who feature in the photos: landless, poor and ‘Untouchable.’ Most of the exhibition venues have also been typical of Sainath’s thinking. Villages, factory gates, schools and colleges, cafeterias or corridors, entrances to mines and quarries, even railway stations. It is perhaps the first Indian photo exhibit to be seen by more rural than urban people. Yet the same exhibition has been sought out and hosted at the Asia Society, New York, the International House of Japan in Tokyo and several universities in Canada and the United States (more on the exhibition on p.7). In 2007, it drew viewers in both the villages of rural India as well as in South Africa, Ireland, Finland and The Netherlands. Since its launch, it has collected over 28 notebooks with thousands of comments in nine languages. Building on this work, Sainath is creating India’s first archive of photographs of rural India, consisting of thousands of pictures he has shot in dramatically different parts of the country. One of the most critical aspects of Sainath’s work has been its impact on public policy, related in particular to the plight suffered by rural India since the nineties. No other phenomenon symbolised this situation as much as the tragic suicides of thousands of farmers in several states of the country. Through several years, Sainath kept at the issue unrelentingly. Today, if the farmers’ suicides are a huge issue in India — as they were in the 2004 elections which saw the defeat of the incumbent government — it can be said that one journalist contributed to that more than any number of politicians did. It is widely believed that Sainath’s reports on hunger, migrations, distress and suicides played a role in pushing the government to move towards programmes and policies like the farm loan waiver, the farm crisis packages — all crucial developments of the past few years. His reporting has also contributed to perceptions of and policy directions in the development of the National Rural Employment Guarantee Scheme (NREGS), considered to be a key development in public policy. During 2008-9, he served as Member of the Expert Group constituted by the Ministry of Rural Development to formulate a methodology for conducting the next Below Poverty Line (BPL) census. The aim was to simplify the identification of BPL families in the rural areas. His work has also had a major influence on the worlds of activism and NGOs, where many use his Everybody Loves A Good Drought as an activist’s handbook. In just the past few years, Sainath has published over 150 investigative reports on the agrarian crisis in The Hindu alone, in addition to many other pieces elsewhere. In June 2004, after assuming office as the new prime minister, Dr. Manmohan Singh journeyed to rural India to meet the farmers Sainath had written about. In 2005, Sainath’s reporting on the agrarian crisis in the state of Maharashtra instigated an investigation by the National Farmers’ Commission. Less than a year later Prime Minister Manmohan Singh himself visited the crisis-ridden districts — first speaking to Sainath about the issues. That August 15, the Prime Minister spoke of the agrarian crisis in his Independence Day Speech from the ramparts of the Red Fort. In March 2008, the Government of India, under siege on the agrarian crisis issue, and with election year approaching, announced a $16 billion farm loan waiver to address the distress of indebted farmers. Several farm organisations and activists said they believed that the relentless pressure of one journalist had a major role in the government opting for the waiver. Some called on a bewildered Sainath to ‘congratulate’ him. Sainath’s own reaction was to warn that the waiver could benefit rich farmers on irrigated land more than subsistence peasants on dry lands. Sainath is actively involved in the training of journalists in the poorest regions of India’s countryside. Some of the finest reporters to emerge from rural and non-metro India proudly write of earning their spurs travelling with Sainath in some of India’s poorest villages. He has also been teaching journalism at the Sophia Polytechnic in Mumbai for over 20 years and at the Asian College of Journalism, Chennai since 2001. Many of Sainath’s students have themselves gone on to win major national and international awards. He has also lectured at many universities worldwide, including Columbia University, Harvard University, New School for Social Research (US); Monash University, La Trobe, the Australian National University (ANU), Canberra (Australia); Helsinki University and Tampere University (Finland), University of Western Ontario, Simon Fraser University, University of British Columbia, McGill University, University of Alberta (Canada). Inspired by Sainath’s work, Canadian documentary maker Joe Moulins has produced a documentary entitled A Tribe of His Own: The Journalism of P. Sainath. Till date, it has won 14 international awards including the top ones at the Columbus (Ohio) and the Global Visions (Edmonton, Canada) film festivals. The jury at the Edmonton Film Festival called this ‘an award about inspiration’, a thought that has been echoed several times by critics (more on the film on p.9). A new film by Deepa Bhatia titled ‘Nero’s Guests’ on the subject of inequality as seen through Sainath’s work was screened (as an official selection) at the Amsterdam Documentary Film Festival in November 2009. At the Mumbai International Film Festival, February 2010, it won two awards. It has won others, too, including the first prize at the Cinestraat documentary film festival in Spain in 2011. It has also won the Indian Documentary Producers Association’s Gold Medal for best documentary in December 2010. First to win awards from three major Indian newspapers he has never worked for: The Times of India, The Statesman and the Indian Express. Book: Everybody Loves a Good Drought. Stories from India’s poorest districts Penguin, India 1996. UK edition, Headline, 1998. Also published in Odiya, Marathi, Hindi, Bengali, Kannada, Malayalam, Swedish, Finnish and German. In 2012, the publishers declared the book a ‘Penguin Classic’ and issued a special edition with the old classic Penguin cover of the 1960s. Meanwhile, the book is in its 43rd print and remains a big seller. Chapter: Mass Media – but where are the masses? In book: Bridging the gap. Eds: Latha Pillai & Babu P. Remesh. SAGE, New Delhi, UK, USA 2011. Published Lecture: India in the Age of Inequality: Farm crisis, food crisis and the media. Second B.M. Pugh Memorial Lecture 2009. National Council for Educational Research & Training (NCERT), New Delhi. Chapter: The Age of Inequality. In book: Contradictions of Globalization: Democracy, Culture and Public Sphere. Ed. Tessa Morris-Suzuki. I-House Press, International House of Japan 2008. Chapters: Four stories in book Writing of a Nation. An Anthology of Indian Journalism. Ed. Nirmala Lakshman. RUPA & Co. New Delhi 2007. Chapter: The Age of Inequality. Life in the times of Market Fundamentalism. In Book: Unequal Worlds. IHJ, Japan Foundation, Tokyo, 2004. Chapter: The Hills of Hardship. In book: Greatest Reportage of the 20th Century. Ordfront, Sweden, 2001. Chapter: The Age of Inequality, in book India, Another Millennium. Editor Romila Thapar. Penguin India 2000. Chapter: The Elephant Man, in book Elsewhere, Unusual Takes on India. Editor Kai Friese. Penguin India 2000. Chapter: Reports from Orissa, in book The Penguin Book of Indian Journeys. Editor Dom Moraes. Viking, India 2001. Chapter: Reporting Poverty. In publication Communication and the Globalisation of Poverty, WACC UK 2000. Chapter: Fact and Fiction. In Exploring the Heartland: An Agenda for the Media. Press Institute of India, Gyan Publishing House, New Delhi 1998. Chapter: Communalism & The Media. In book Communalism in India: Challenge and Response. Editors: Mehdi Arslan and Janaki Rajan. Manohar, Delhi, 1993. 1986-87- present: Journalism Professor (Visiting) at Sophia Polytechnic, Mumbai, India. Over 1,000 students from that institution alone presently in diverse branches of the media. 2000-present: Adjunct Faculty, Asian College of Journalism, Chennai, India. Since 1993, trained large numbers of rural journalists in very backward districts of India and continue to hold regular workshops for stringers and reporters in such regions. Focus in recent years has been on in-the-field training of rural journalists, for instance in Kalahandi, Bolangir and Nuapada (among many other places). When close to 30,000 women, mostly landless labourers, queued up in Vizag city in India to see a photo exhibition a few years ago, it was an unusual one on their own lives. Consisting of about 70 black and white photographs with text, the exhibition is on “Women & Work in Rural India.” It is titled Visible Work, Invisible Women. The pictures, shot in the poorest regions of ten states across the country by Sainath, show the astonishing labour that poor women put in every day of their lives and the gigantic — yet unacknowledged — contribution they make to the national economy. A contribution worth, literally, billions of dollars. Each of ten panels deals with different kinds of work that women do. The text details the scope, significance and centrality of that labour to the Indian economy, particularly to agriculture. There are no clichéd hand-to-mouth, begging bowl photographs in this exhibition. Instead, these are pictures of enormous strength and dignity. They are far more representative of the overwhelming majority of the poor, seeking employment and opportunity rather than pity or charity. Shot during the first decade of India’s economic reforms, the pictures place women’s labour at the centre of the rural Indian family’s survival strategies. It was inaugurated in Vizag city by four of the landless women agricultural labourers who figure in the photographs. They sang a song of working women from the fields and declared it open. At the main Vizag venue, close to 30,000 poor landless women from the villages saw the show at the Bulaya College grounds during a mass rally of landless women there. In Jaipur city, it was inaugurated by a landless dalit woman. In Chennai city, by a woman construction worker struggling to find more than 15 days work in a month and working like a slave when she does. In Pudukkottai district, Tamil Nadu state, it was inaugurated by Palaniamma, a leader of the women quarry workers of the region. The exhibition has had a curious mix by way of audiences. The largest group if viewers has been from the class of women portrayed in the photographs themselves. At the same time, a number of young women have seen it at the city women’s colleges where it has been shown (including Miranda House in New Delhi, Kanoria College in Jaipur and Stella Maris College in Chennai). The response from both these and other sections has been exhilarating. Some of the girls of Kanoria college actually wrote poetry in the comments book. With non-literate agricultural labourers, their comments were taken down by volunteers. In Keelakuruchi, a home base of the literacy movement, the neo-literates wrote their comments themslves. With upper-middle class young women — mostly college students — the response was to come back with notebooks, sit on the floor and take notes from the text that goes with the photos. The Exhibit drew large numbers of viewers at the Asian Social Forum in Hyderabad. In Sholapur, over a thousand women workers of that city viewed the pictures on a single day. One of Sainath’s projects now is to convert the exhibit into same size posters that any individual or group can out up anywhere — a concept of “exhibition-under-your-arm” to meet this demand. Another, more ambitious project of his is to create a Visual Archive of Rural India. Documentary by Joe Moulins, 50 minutes. “An introduction to one of the most admired and effective journalists of our time…a man whose life’s work is making the world a better place..” — The Toronto Star. A Tribe of His Own is being used at journalism schools in several universities as teaching material for young, aspiring journalists. Another documentary woven around Sainath’s work, Nero’s Guests, by award-winning film maker Deepa Bhatia, was just screened at the IDFA section of the Amsterdam documentary film festival – and has been selected for major festivals in several countries. Nero’s Guests looks at inequality, the farm crisis in India and other issues, through Sainath’s travels, writings, speeches and photographs. This is the second international documentary (Indo-European collaboration) to have been made on Sainath’s work. That makes him the only Indian journalist to have two international documentaries delving into his coverage of some of the most complex and difficult issues. Nero’s Guests won the Indian Documentary Producers Association’s Gold Medal last December, the first prize at the Cinestraat Festival in Spain, the first prize in the Indian Film Festival, London – in all, over 10 awards. The film seems to have taken on a life of its own as hundreds of screenings have been organised by groups of students, universities, activists, film buffs and others. It has also been screened in some of the worst affected regions of the agrarian crisis. The proceeds from Nero’s Guests have been contributed entirely to the widows and families of the farmers who have commited suicide in India’s ongoing agrarian crisis. Harry Chapin Media Award: Judge’s Prize, New York, U.S.A.
Trinity College, Hartford Ct. U.S.A. Global Human Rights Journalism Prize. First winner, inaugural year of the prize. SAIS-Novartis award for Excellence in International Journalism (given to those in the top ten shortlist made by a panel at the SAIS, Johns Hopkins).